But obviously that’s a pretty bold claim to make, and it’s even more suspicious when you realize that you have to actually pay money to get started with it… So what’s the deal here, is it actually legit or is eCom Profit Sniper a scam that’s just out to part you with your cash? What Exactly Is The eCom Profit Sniper System? 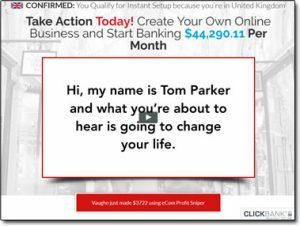 The eCom Profit Sniper system, which has allegedly been put together by a guy named Tom Parker is a system that claims it can make you rich through eCommerce by exploiting a so-called “little known secret”. The system claims that it can enable you to earn profits of over $44k per month, which I think you’ll agree is an awful lot of money… But on top of that it even claims that you will be able to make $2,000 in your first day with just 20 minutes of work – even if you’re completely brand new. And to be honest I’m not going to lie a claim like that just screams out scam to me. It immediately makes me think of the typical get-rich-quick programs like Wiseball Secret Society & Get Paid 1K Per Day which promise the world but deliver nothing… I have a feeling that eCom Profit Sniper is likely going to do the same. How Does The eCom Profit Sniper System Work? But guess what that so-called secret is? Yes, the “little known secret” Tom shares with you is indeed Shopify, one of the largest eCommerce platforms in the world – so I think you can probably tell that it’s not actually a secret at all. Tom says that his system is going to help you make tons & tons of money through Shopify, he says that you will become a millionaire in no time at all thanks to the training that he is going to reveal to you. But before I go any further in explaining how it works, for those who don’t know let me just point out that Shopify is basically just a platform that enables you to create your own online store to sell things. Tom makes out that Shopify can make you a lot of money, but the reality is that Shopify doesn’t actually make you money – as I say it’s literally just a platform that provides you with a website which you can use to sell products through. They don’t actually promote your store or anything like that, that’s up to you to do so Shopify itself isn’t going to make you rich. The eCom Profit Sniper system isn’t really a system at all, it’s quite misleading. You’re led to believe you’re going to be getting access to some sort of autopilot system that will make you money through eCommerce without you really having to do anything but in reality that’s not the case. eCom Profit Sniper is actually just a training program, a training program that teaches you how to sell things through Spotify using the dropshipping method. Dropshipping is basically where you list products on your store that you don’t actually own, then you wait until a customer purchases them before you buy them & when you do you have them sent directly to the customer. So as an example you could create a Shopify store selling teddy bears for $50 a bear. These could be bears that you’ve seen for sale on Amazon for $30… You then simply wait until a customer purchases one, then you use the $50 to buy it from Amazon & have the seller ship it directly to your customer. The customer never knows any different but you make yourself around $20 in profit. Now obviously whilst it seems easy it can get a little complicated – it’s not quite so straight forward as that. If it was then as you can imagine everybody would likely be doing it… It’s actually quite hard to make money with it unless you really know what you are doing because you can get some hiccups which can actually end up costing you money instead (such as problems with orders). I won’t lie, it’s easy for anybody to setup a Shopify store & it’s easy for anybody to get started with the dropshipping method, after all it’s not rocket science. However in order to make money you are going to need to know how to actually effectively promote your store online… This is where most people fail. Tom’s eCom Profit Sniper claims to contain the missing ingredient. He claims his system & training is going to show you how you can get floods of visitors coming to your store every single day, so many in fact that you will be making upwards of $2,000 per day. However in my opinion this is all just BS. The training provided through this system is pretty low quality & whilst it will likely help you get started, there is absolutely no way it is going to see you generating the large amounts that it promises. I will be honest here and say that you will actually be lucky if you manage to just break even with Tom’s training because the method he teaches you is Facebook advertising & that can get very costly very quickly. 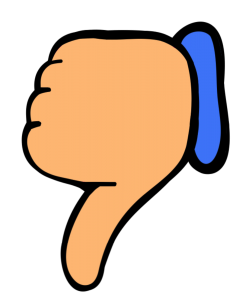 If you make a mistake with Facebook advertising you are going to lose money not make it… And it will likely take you months of trial & effort before you even crack how to break even using this method so expect a lot of losses in the first few months. On the plus side at least you do actually get some training in return for your purchase (even though it’s not that good). Lately I’ve seen a lot of get-rich-quick scams which simply take your money & provide you with absolutely nothing in return… So whilst this may not be the best system in the world, similarly it’s not the worst (though to be honest due to it’s insanely hyped up claims it’s not far off). My Verdict – Is eCom Profit Sniper a Scam? To be honest this is a bit of a hard one for me to decide. I am going to come to the decision to say that no it’s not a scam because it does actually provide you with some training on how to make money, but I am not going to be recommending it due to the fact that it’s very misleading. The program promises that you will be making over $44k per month which is simply not going to happen, but what’s worse is that it promises you can make $2,000 in your very first day. This is something I don’t like because it’s not true & it means that somebody who might be in a desperate financial situation may see this & spend their last bit of money on this program in the hope that they are going to make $2,000 back. So I think the marketing from this system is unethical & it could leave people in a really bad situation, especially those who are new to making money online & don’t really know how it all works. Which by the way, if that’s you then you can check out my free guide for making money online here. Passive Money Miracle – Scam System or Legit Way To Earn? My Review EXPOSES It! MOBE Review – Can Matt Lloyd Really Help You Create Your Own Online Business Empire?